Most Americans are shocked by the increasingly frequent scenes of wailing mothers and babies being torn apart by government officers at the Mexican border. The Trump administration has ratcheted up the separation of children from parents as a way to deter migrants from Central America. Some critics denounce this practice as “un-American.” It is certainly immoral and violates human rights. But it’s not unprecedented. Indeed, for long stretches of American history, it was commonplace for children to be snatched from their families. Solomon Northup, a free black man living in New York, was kidnapped into slavery in 1841. 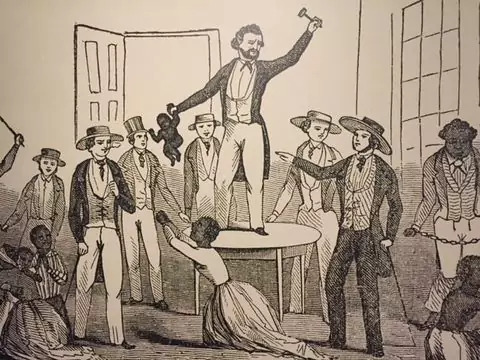 In his memoir, “Twelve Years a Slave,” he described a slave auction where a woman named Eliza and her little daughter, Emily, were sold to different buyers. “Never have I seen such an exhibition of intense, unmeasured and unbounded grief,” he wrote. Enslaved African-Americans often experienced nightmares like these. The likelihood that slaves would be separated from kin increased as slavery expanded west into the cotton- and sugar-producing lands acquired through the Louisiana Purchase. Scholars estimate that more than one million enslaved people were “sold down the river” from the Upper South to the Lower South from 1790 until the outbreak of the Civil War. The historian Ira Berlin calls this the “Second Middle Passage,” following the original “Middle Passage” by sea that brought Africans to the Americas. This trade became big business in the slaveholding states, second only to plantation slavery itself. The impact on slave families was devastating. Slaves who had lost loved ones were punished if they dared to cry, complain or fight back. To justify their brutality, slaveholders used the perverse reasoning, articulated by Thomas Jefferson in the 1780s, that slaves were incapable of expressing sentiment or love. The end of slavery after the Civil War did not end family separation. In 1865 and 1866, Southern states passed “apprenticeship laws” that were part of the region’s Black Codes meant to restrict the rights of the newly freed. States took custody of children who were deemed “orphans,” even when they had parents or relatives willing and able to take care of them. These children were often forced to work for their former owners. This was considered sound treatment of “savages” after annihilation had failed to fully eliminate them. Assimilation was the main goal of the schools: The children’s names were changed, their language, religions and other cultural traditions suppressed. Another cycle of forcible separation of Native American children from families began in the 1950s when the federal government instituted an adoption program. Native Americans whose parenting practices were perceived to breach white norms or whose conduct was seen as suspicious — conduct as anodyne as taking a child to a hospital or leaving children with a babysitter or extended family members — had their children taken away from them and handed over to white families. People who refused to give up their cultural traditions were particularly vulnerable to losing their kids. The Indian Child Welfare Act of 1978 sought to put an end to these practices, though without complete success. Native American children are still disproportionately in foster care programs in many states. So this history of breaking up families continues, with the same sort of rationales used. President Trump has repeatedly called young border crossers future criminals, with the seizure of children described as a national security measure that will prevent crime later. “They look so innocent; they’re not innocent,” Mr. Trump said in response to criticism of his policy. Meanwhile, Trump supporters among the Christian right and the anti-abortion movement — outspoken advocates of the idea that families are the bedrock of society — are silent in the face of this brazenly anti-family practice. There is no way to reconcile their decades of pushing “traditional family values” with condoning a president who treats the families of people of color as unworthy of protection. It is long past time that we end the destructive patterns of family separations that have been a part of our nation’s history. An earlier version of this article misstated a detail of the history of boarding schools for Native American children. Such schools still exist; they did not all close by 1896.